“Customer relationship management” (CRM) can sound intimidating to small- and mid-sized businesses. After all, if your company only has a handful of customers, why do you need a dedicated process or system to keep track of them? At its core, a CRM is not just useful to large enterprise companies—it’s essential for businesses of all sizes. But don’t just take our word for it. 75% of sales managers say that using a CRM helps to drive and increase sales? CRM systems improve customer retention by 27%? 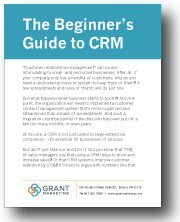 Fill out the form and download the Beginner’s Guide to CRM now!